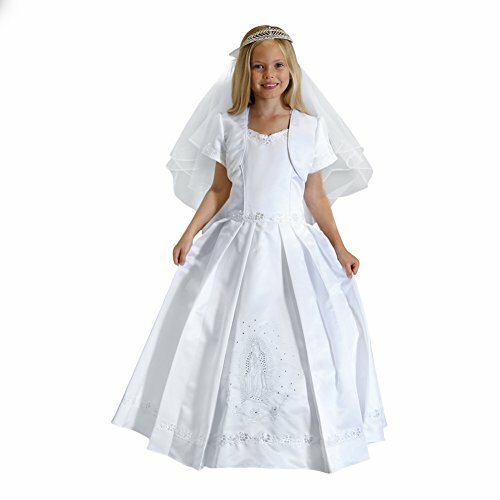 An elegant Holy Communion dress from Angels Garment for precious girls. Pretty satin dress with sequin/pearl lace trim detail. Front of skirt embroidered with the image of "Our Lady of Guadalupe". Adjustable lace up corset back. Matching bolero included. Fully lined with ruffle netting attached. An optional petticoat can be worn for a fuller look. Made in USA of imported fabrics. Front of skirt embroidered with the image of "Our Lady of Guadalupe"
If you have any questions about this product by Angels Garment, contact us by completing and submitting the form below. If you are looking for a specif part number, please include it with your message.